Linda and I went for a lookie see yesterday - covering an area of about 30 hectares, al-Azhar Park is the largest expanse of green in Cairo - perfect for a hot day, with temperatures up now - 38c on Thursday - the locals tell me this is unusual for this time of year. Established by the Aga Khan Trust For Culture in 1984, the park was built over the top of a huge pile of rubble that had been turned in to a rubbish tip. Hard to believe as al-Azhar Park is a peaceful oasis on the edge of the chaos of Islamic Cairo. Paths meander through idyllic gardens, with many water features. We had a yummy lunch in a traditional style building in the grounds. 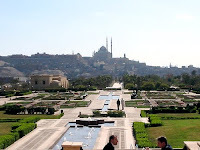 Because al-Azhar Park is on a hill, you get amazing views all over Cairo. On a clear day (that would be a lucky day) you can even see the Pyramids. As with much of Cairo, the best bit is people-watching: old men reminiscing on benches, children playing games happily, and daring young lovers holding hands as they stroll through their own little world. The 800 year-old Ayyubid wall surrounding some of the park has been partially restored.